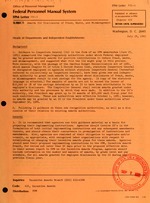 Vols for 1979- issued by: Office of Personnel Management. Description based on: 410-19 (Aug. 22, 1977); title from caption. Latest issue consutled: 292-23 (No. 3, 1983); title from caption. form the basi of a further claim of any nature against the Govern. ment by the employee, hos heirs, or assigns. ble to the employee's disclosure. the awards permitted under this section. tion substantiating any award made unde this section. awards to verify the cost savings for which the awards were made. dent may nut mak more than 50 awards under t"i section.